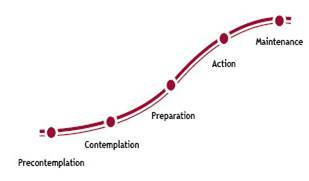 In the Stages of Change or “Transtheoretical Model”, change is a process involving progress through a series of stages. These stages utilize a combination of the most effective techniques to achieve higher rates of success in addiction recovery. In addition, the researchers conceptualized “relapse” (recycling) which is not a stage in itself but rather the “return” from action or maintenance to an earlier stage. 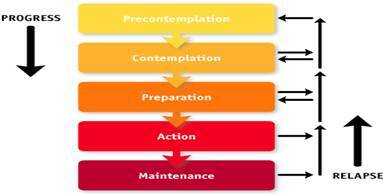 Stage 1: Precontemplation (Not Ready) People at this stage do not intend to start the healthy behavior in the near future (within 6 months), and may be unaware of the need to change. People here learn more about healthy behavior: they are encouraged to think about the Pros of changing their behavior and to feel emotions about the effects of their negative behavior on others. Precontemplators typically underestimate the Pros of changing, overestimate the Cons, and often are not aware of making such mistakes. These individuals are encouraged to become more mindful of their decision making and more conscious of the multiple benefits of changing an unhealthy behavior. Stage 2: Contemplation (Getting Ready) At this stage, participants are intending to start the healthy behavior within the next 6 months. While they are usually now more aware of the Pros of changing, their Cons are about equal to their Pros. This ambivalence about changing can cause them to keep putting off taking action. People here learn about the kind of person they could be if they changed their behavior and learned more from people who behave in healthy ways. They’re encouraged to work at reducing the Cons of changing their behavior. Stage 3: Preparation (Ready) People at this stage are ready to start taking action within the next 30 days. They take small steps that they believe can help them make the healthy behavior a part of their lives. For example, they tell their friends and family that they want to change their behavior. People in this stage are encouraged to seek support from friends they trust, tell people about their plan to change the way the act, and think about how they would feel if they behaved in a healthier way. Their number one concern is—when they act, will they fail? They learn that the better prepared they are the more likely they are to keep progressing. Stage 4: Action People at this stage have changed their behavior within the last 6 months, and need to work hard to keep moving ahead. These participants need to learn how to strengthen their commitments to change and to fight urges to slip back. People in this stage are taught techniques for keeping up their commitments such as substituting activities related to the unhealthy behavior with positive ones, rewarding themselves for taking steps toward changing, and avoiding people and situations that tempt them to behave in unhealthy ways. Stage 5: Maintenance People at this stage changed their behavior more than 6 months ago. It is important for people in this stage to be aware of situations that may tempt them to slip back into doing the unhealthy behavior—particularly stressful situations. It is recommended that people in this stage seek support from and talk with people whom they trust, spend time with people who behave in healthy ways, and remember to engage in alternative activities to cope with stress instead of relying on unhealthy behavior. Processes of change The ten (10) processes of change are covert and overt activities that people use to progress through the stages. To progress through the early stages, people apply cognitive, affective, and evaluative processes. As people move toward maintenance or termination, they rely more on commitments, conditioning, contingencies, environmental controls, and support. Prochaska and colleagues state that their research related to the Transtheoretical Model suggests that interventions to change behavior are more effective if they are “stage-matched,” that is, matched to each individual’s stage of change. Consciousness Raising Increasing information about self and problem: observations, confrontations, interpretations, and bibliotherapy. Both Dramatic Relief/Emotional Arousal and Environmental Re-Evaluation can be thought of as sub-techniques of Consciousness raising. Dramatic Relief or Emotional Arousal Experiencing and expressing feelings about one’s problems and solutions: role playing, “stages” of grieving, etc. Environmental Re-Evaluation Assessing social and physical impacts of behavior: empathy training and documentaries. Contemplation to Preparation Some sources place emotional arousal in this phase. Self-Reevaluation Assessing feeling and thoughts about self with respect to the target behavior: value clarification, imagery, corrective emotional experience. Preparation to Action “Self-liberation” is emphasized. Commitment Choosing and committing to an act: decision-making therapy, social contracts, New Year’s resolutions. Helping Relationships Someone who helps keep one accountable to their commitments, give feedback, supportive emotionally, and offer serves as a model for what change will bring them: therapeutic alliance, social support, self-help groups. Reinforcement Management Continuing the reinforcement of positive benefits to change. Stimulus Control Controlling stimuli that prompt previous behavior. Social Liberation Social Liberation is emphasized across all of the stages and all stages use techniques during the stage, not just during transition. Decisional balance This core construct “reflects the individual’s relative weighing of the pros and cons of changing Decision making was conceptualized by Janis and Mann as a decisional “balance sheet” of comparative potential gains and losses. Decisional balance measures the pros and the cons that have become critical constructs in the Transtheoretical model. The pros and cons combine to form a decisional “balance sheet” of comparative potential gains and losses. The balance between the pros and cons varies depending on which stage of change the individual is in. Sound decision-making requires the consideration of the potential benefits (Pros) and costs (Cons) associated with a behavior’s consequences. Decisional balance is one of the best predictors of future change. TTM research has found the following relationships between the Pros, Cons, and the stage of change across 48 behaviors and over 100 populations studied. The Cons of changing outweigh the Pros in the Pre-contemplation stage. The Pros surpass the Cons in the middle stages. The Pros outweigh the Cons in the Action state. Self-efficacy This core construct is “the situation-specific confidence people have that they can cope with high risk situations without relapsing to their unhealthy or high risk habit -Self-efficacy conceptualizes a person’s perceived ability to perform on a task as a mediator of performance on future tasks. A change in the level of self-efficacy can predict a lasting change in behavior if there are adequate incentives and skills. The Transtheoretical model employs an overall confidence score to assess an individual’s self-efficacy. Situational temptations assess how tempted people are to engage in a problem behavior in a certain situation. 3. Strategies that can help them make and maintain change—the TTM calls these processes of change.